EAST HARLEM — A promising chef, a passionate musician, a dental assistant and a Hunter College security guard were among the victims of an explosion that leveled two East Harlem buildings, as rescuers continued their desperate search through the rubble Thursday for the missing. Among the dead was Andreas Panagopoulos, 44, a musician who worked in advertising at a Spanish language magazine, who had been sleeping at the time of the explosion, friends and sources said. "He was a wonderful man, a very happy person," said friend Derek Moreno, who was among those gathered at the medical examiner's office to identify their loved ones. "He loves parties and he was a very good husband." The victim's wife, Liseth Pérez Almeida, who works as an editor at El Diaro, was inconsolable as she was surrounded by friends and family. "No more hopes...he's gone," she wrote on her Facebook page. 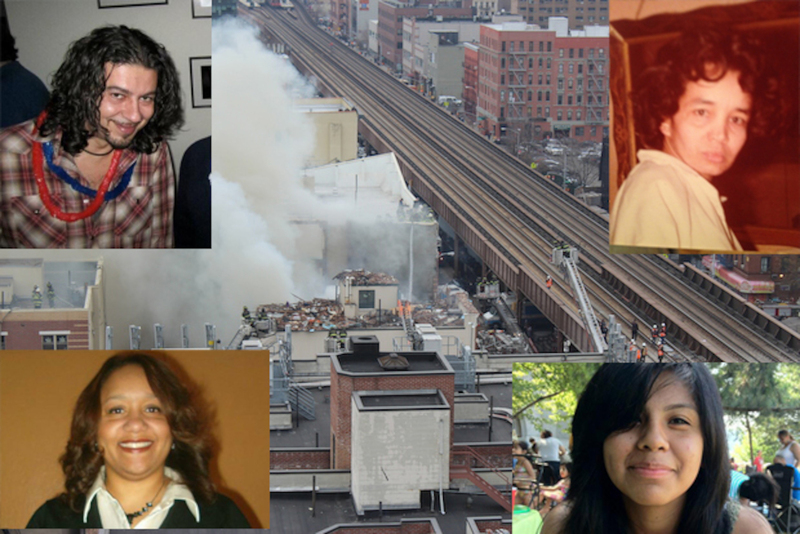 Almeida had been on her way to work when the explosion happened, according to friends. A fundraising page was set up on the site GiveForward Thursday for the grieving wife. Panagopoulos, who was originally from Greece, used to play guitar in a blues rock band called Evergreen, the Wall Street Journal reported Wednesday. Longtime friend Hector Castañeda said he was also had a small recording studio in his home. "We had Thanksgiving dinner together. Of all people, I can't believe that he's the first to go," Castañeda, 34, said. "He was very strong, smart, open-minded and he was passionate about history and politics." Carmen Tanco, whom relatives had been searching for at area hospitals, was also identified Thursday. ''I cried all night. She was a very nice person. She'd give the shirt off her back," said friend Irene Riley, 54, who works at Madison Avenue Laundry, near the victim's home. Tanco, who lived on the first floor of 1644 Park Ave., worked at dental assistant, according to her cousin Diana Cortez, who spoke to reporters outside of Harlem Hospital Wednesday. She was off from work when the explosion happened. A third victim identified Thursday, Rosaura Hernandez, 21, was a line cook at Triomphe Restaurant in Midtown. She started out as an intern there and had been working full time as a line cook since July, working on the grill and other stations and helping out with large catering events. "Our chef saw the raw talent in her and when the position opened up we extended it to her," said Robert Holmes, general manager of the Iroquois Hotel, where the restaurant is located. "Working in a kitchen is a demanding place and she was able to handle it with ease." Her former teacher, Rick Black, told DNAinfo Hernandez was a hard-working student. "Rosie was a selfless kid. She skipped her graduation to sit by her mother's side 2 years ago while her brother Oscar was being operated on," he wrote via Facebook. "She knew what she wanted to do, and went after it with gusto. She went to culinary school and was already building a career for herself at age 20." Her death sparked an outpouring of grief on her Facebook page. "I cant believe this its unreal i just heard about this and we were talking not long ago smh imma miss you so much," posted Bianca Rivera. Hunter College security guard Griselde Camacho, a mom and former police officer from Puerto Rico, was the first victim to be identified Wednesday afternoon. "The death of...Griselde Camacho in the building collapse in East Harlem, and the hospitalization of her mother, brings great sadness to all of us," Ayman El-Mohandes, the dean of the School of Public Health, said in a statement. "My sincere condolences go out to her family and to all of you who knew her and loved her." Both Camacho and Tanco attended church at Harlem's Bethel Gospel Assembly. The church's bishop, Carlton T. Brown, said the congregation's "prayers are with their families at this time," in a Facebook message. "Our hearts are heavy as we will truly miss these two beautiful women. Many of us share fond memories on how they have blessed our lives with their warm smiles and caring natures," the message went on to say. "They were both faithful volunteers whose love for The Lord shone brightly. We rejoice in the fact that we KNOW they are with the Savior whom they loved and served faithfully. " Searchers continued to dig through the wreckage Thursday afternoon while several people, including Jordy Salas of 1644 Park Avenue, remained missing. Salas, a student whose wife is pregnant, was home sleeping at the time of the blast, according to relatives and reports. Additional reporting by Murray Weiss, Janon Fisher, Trevor Kapp.